Place beans in a large saucepan of boiling water. Bring to a boil, then reduce heat to low. Cover and cook for 20 minutes or until beans are soft and fluffy. Meanwhile, heat oil in a saucepan over medium heat. Add onions and garlic and cook for 1 minute. Set aside to cool. Transfer the beans to a food processor. Add cooled onion mixture (including oil), coriander, tahini, lemon juice, water and Moroccan spice. Puree until smooth. If a little thick add a little more water or lemon juice. 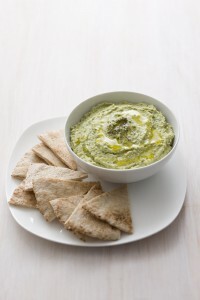 Serve with toasted wholemeal pita bread, or vegetable crudite.